Weekend Assignment #82: What was your favorite bedtime story as a child? Extra Credit: As an adult, have you shared that favorite bedtime story with a child? This may sound strange, coming from someone who owns thousands of books, including at least a hundred kids' books; but I don't recall ever being read to at bedtime. That's right; I said ever, E-V-E-R. While it may have happened, all my memories are of me doing the reading, with or without adult assistance, and doing so by daylight. I don't know why. That's just what I remember. I remember Mrs. Livingston reading Winnie-the-Pooh to our first grade class, and my grandmother's subsequent gift to me of her personal copy of the book, printed in 1945. I still have it, dark with age and cigarettes, worn and dog-eared. I remember how much I loved One Fish, Two Fish, Red Fish, Blue Fish. Still do. I bought it again as an adult, but it's hiding from me just at the moment. I can still recite two of the poems in it from memory, but I'll try not to do so now. My two other Dr. Seuss favorites were Green Eggs and Ham (I told you about my dad making green eggs and ham for me, remember?) and Ten Apples Up on Top. The latter book is attributed to Theo LeSieg, not Dr. Seuss, but that's just another variant name for good old Ted Geisel. I think he didn't put the Seuss name on books unless he did the illustrations. I remember reading something called Little Dog Tim over and over in the school library in first grade. 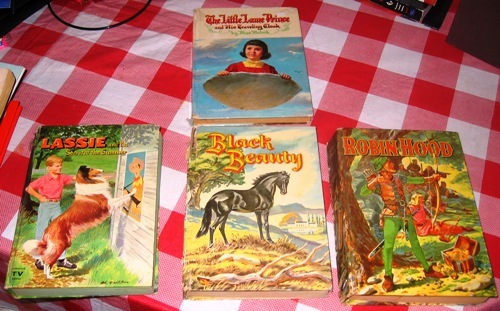 I remember getting and reading my brother's hand-me-down Whitman books of Tom Sawyer and of Howard Pyle's Robin Hood. I think I got Black Beauty for Christmas or my birthday. 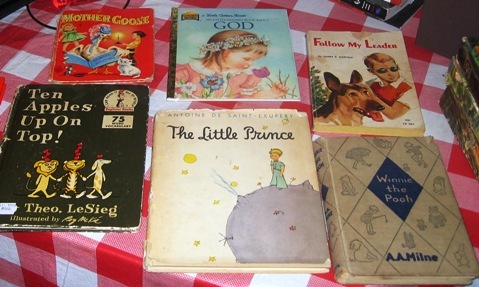 Other beloved hand-me-down books from Steve were Sunnybank: Home of Lad and Further Adventures of Lad by Albert Payson Terhune; and another Whitman book, Lassie and The Secret of the Summer. I read the Lassie book so many times that I can still tell you that Jeff's favorite musician, according to the book, was someone named Dan Dawson. But I had to wonder, who the heck was Jeff? Lassie's proper owner was Timmy, in my experience. I remember reading a biography of Henry Ford once when I had the flu, and one of Helen Keller (I think I was healthy for that one). I remember reading another of my grandmother's old books, given to me around 1965. It was an 1865 edition of The Cricket's Friends by Cousin Virginia. As I recall, the Cricket's close friends included a saucepan and a teakettle. Go figure. I think it was a little water-damaged (probably by me), but basically still in nice shape. There was even a tipped-in sheet of tissue paper protecting the frontispiece. In the early 1970s, my mom encouraged me to donate the book to the Arents rare book collection at Syracuse University's Bird Library. I got a nice letter back from the collection's curator, thanking me and identifying the mysterious Cousin Virginia by full name. I'm sorry to say that I almost regret the donation, though. I'd like to reread the book! Maybe someday I'll buy a copy online. I know it turns up for sale, in several printings from the 1860s. I remember reading A Wrinkle in Time when I was in fifth grade. It's fair to say that it's had a lasting impact on my life. I remember loving The Little Prince, and also The Little Lame Prince (no relation), The Little Lost Angel and The Five Little Kittens. Well, maybe not so much the kittens. Hmm. This cake looks kind of bumpy. Maybe Ma won't see it's lumpy. I know it will be good to eat. "No, Ma, please, Ma, no, Ma, no." She said, "Billy, you are silly. This is junk. Out it will go." I remember the books I bought for myself: Skip (about a blind dog) and Follow My Leader (about a blind boy and his dog) from the Arrow Book Club, and Peanuts books from Economy Books at Shoppingtown, back before it was a mall. 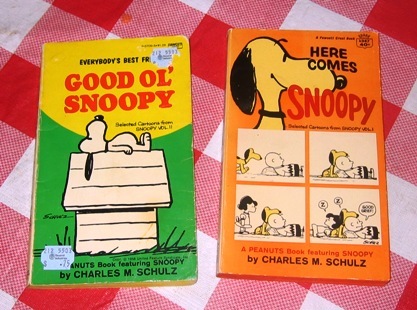 I think the Peanuts books were 50 cents at the time. My allowance was a quarter. That meant I could buy one every two weeks, if managed to scrounge the tax from Mom. And I remember fairy tales, especially a very small book of The Bremen Town Musicians, and other one of The Princess and the Pea. The first one I loved because it was about animals. I'm not sure how I feel about the second one now. Like Snow White and Cinderella, the protagonist is virtuous and downtrodden, which certainly has its appeal. But are we supposed to applaud her for being oversensitive, supposedly a sure sign of royal blood? If that were true, I'd be a queen! Did I have a favorite story? Sure. I had lots of them, at different times. Little Dog Tim was a big hit with me for a while, probably because it was illustrated with photos instead of drawings. I remember Ten Apples Up on Top being my favorite at one point. I remember reading and re-reading the Snoopy books, probably every day for a while. At one time or another, probably nearly every book I've mentioned above was my "favorite." Extra Credit: I don't have kids, and never had a younger sibling, and my godson lives hundreds of miles away. I did tell most of the plot of The Lion, the Witch and the Wardrobe to some kids I babysat once. Years later, when I was in college, I told the same story around a back yard campfire to the kids next door. Oh, and the last time my godson was in town, I read a few selections from Heirs of Mâvarin to Jacob and his parents. You brought back memories of so many favorite books that I have loved! I still read The Little Prince every now and then, and I even have a copy of it written in French, which I studied in high school. I adore The Lion, Witch and the Wardrobe, but didn't ever read it until adulthood after I got hooked on C.S.Lewis. You'll probably wonder about my mothering skills when I 'fess up and tell you that I read "A Wrinkle in Time" for the sole purpose of helping my son write his book report. Okay, truth be known, I wrote the whole darned thing 'cause he was too lazy to read the book himself! But I did enjoy that book very much, too, though I would need to go back and refresh my memory as to why I enjoyed it so much. What was that word I learned from that book? Hmmm, something that started with a T. Tessernaut? Tesserism? Darn, this is going to drive me nuts all day, and I don't think I still have that book around anymore since we moved! Some of your favorites indicate that you are much younger than I, but I certainly loved the same classics as you. By the way, as a child I was never read to at bedtime either, but I adored books. Thanks for this lovely entry. Maybe I should do the weekend assignment , too , now that you've made the wheels begin to turn! Y'know, I don't recall being read to as a child, tho I'm sure I was, since that's probably where I got my love for reading as both my parents are/were readers. Given that it was 50 years or so ago, I don't really expect to remember. :) I do remember books I read as a child, mainly Dr. Seuss' The Cat in the Hat (I even had a model of the Cat that I made) and a whole lot of Little Golden Books. I just can't remember back to before I could read. HA! I used to have those Snoopy books. I just looked, and they are no longer around, but I still have The Beagle Has Landed.